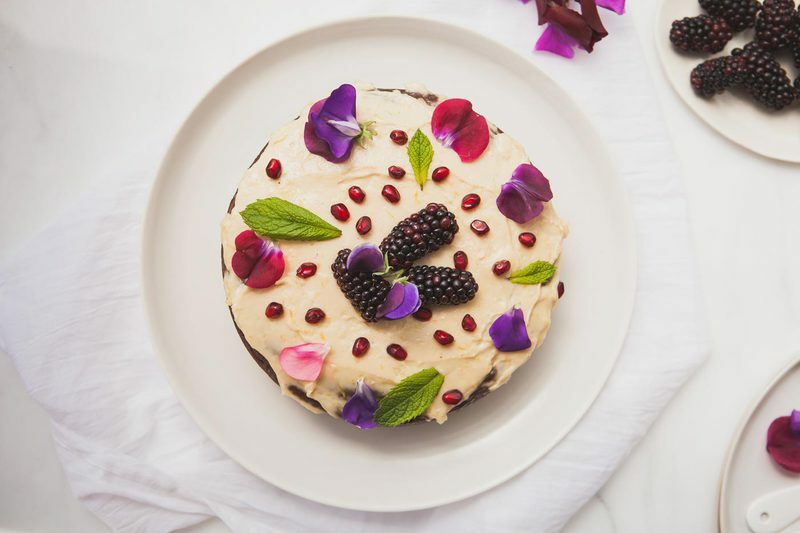 The sweet luxury of having time for kitchen meditation – lost in the alchemy of bringing flavours togethers, filling the house with rich and warming scents, fluttering through the garden searching for fuchsia coloured treasures to decorate with… this is the bliss I’ve been wrapped in post graduation. 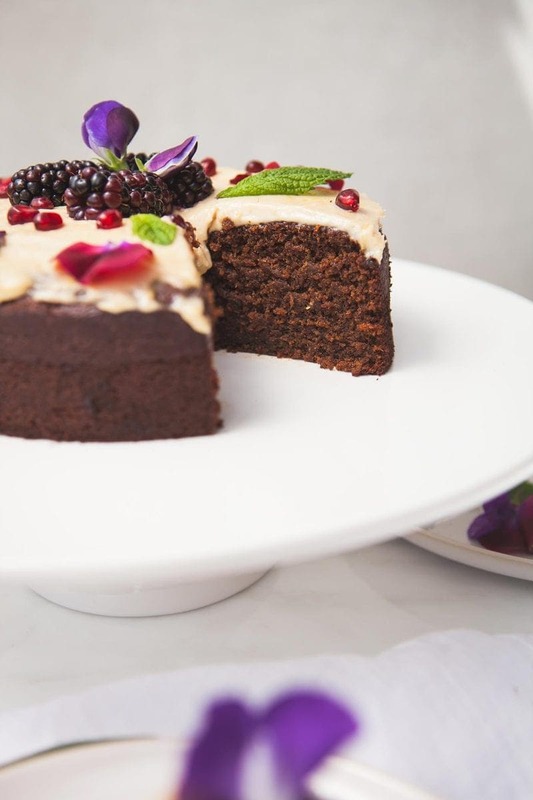 Today’s recipe is an adaptation of my popular Chocolate Cake with Ganache, so shares all the same virtues: made with whole food ingredients, entirely plant-based, gluten free, refined sugar free, free from traditional vegan baking ingredients such as egg replacers and highly processed vegetable ‘butters’, simple, perfect, soft and delicious. Devoured by the family before I could only really have a small slither myself, I had to make it again – which actually wasn’t such a bad thing. 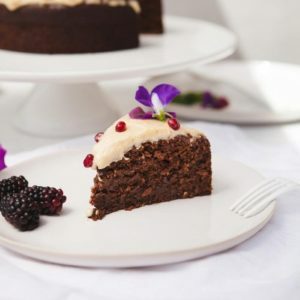 The addition of sticky blackstrap molasses made for a slightly moister cake than the chocolate original, and the raw cashew icing tastes just like a traditional cream cheese icing – without the dairy or icing sugar. The only thing to note about the icing however, is that it is best spread over the cake right before serving as it can tend to discolour slightly. Buckwheat flour is used in place of wheat flour, and is naturally gluten free. 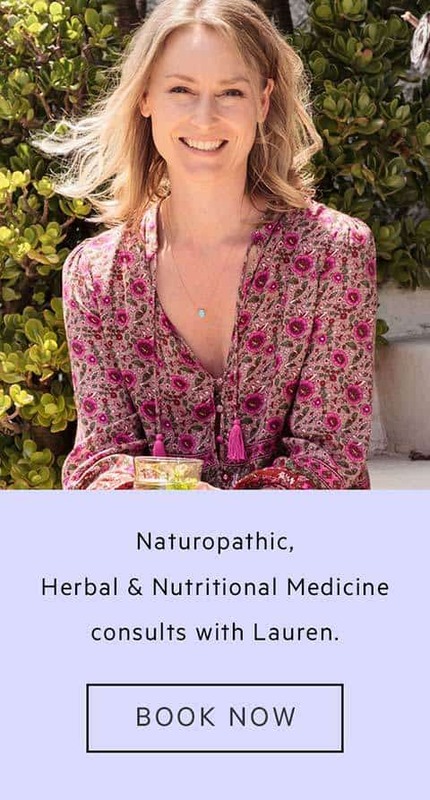 As a functional food, it has attracted attention for its healing effect on some chronic diseases. 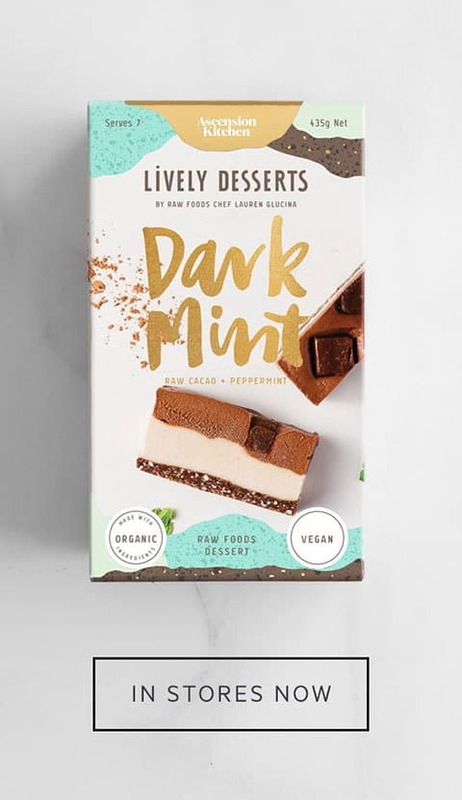 It contains two special flavonoids called rutin and quercetin, which have been shown in studies to be anti-inflammatory and supportive of cardiovascular health. Buckwheat is a relatively high-protein ‘flour’, it contains all essential amino acids and is also a good source of magnesium – a mineral often depleted during stress. I’ve written in detail on the nutrition and health benefits of buckwheat here. Almond meal is used to complement buckwheat, it is also high in protein, heart healthy monounsaturated fats, and the amino acid arginine. It helps keep the cake soft and fluffy. Organic, unsulphured blackstrap molasses is a natural sweetener which in my opinion is a health tonic in it’s own right. Yes – it is a form of sugar – but it is actually a potent source of minerals. A 15ml serving (one tablespoon) contains 3mg of iron (the RDI for adult women is 8mg/day), 115mg of calcium (the RDI for adult women is 1000mg/day), and 32mg of magnesium (the RDI for adult women is 320mg/day) . Whole Medjool dates lend a caramel taste, bringing fibre and minerals along with their natural sugars. Rice malt syrup further adds a mild sweetness, without any fructose (a simple sugar not well metabolised by the liver). Ginger powder, best fresh (stale powder loses its gorgeous smell) is a known carminative – helping settle upset stomachs. It also promotes circulation and is warming to cooler constitutions. Cinnamon, another carminative due to the essential oil content, has been shown in studies to reduce blood glucose levels. Psyllium husks, pure dietary fibre from the plantago ovata plant, swell to form a gel when combined with liquid, making a vegan-friendly natural egg replacer. Coconut oil lends antiviral and antibacterial actions via its lauric acid content, and lastly, the organic soy lecithin used in the icing is necessary to help emulsify, thicken and set the mixture – though is also a great source of choline – a B-group vitamin required for the synthesis of the neurotransmitter acetylcholine. 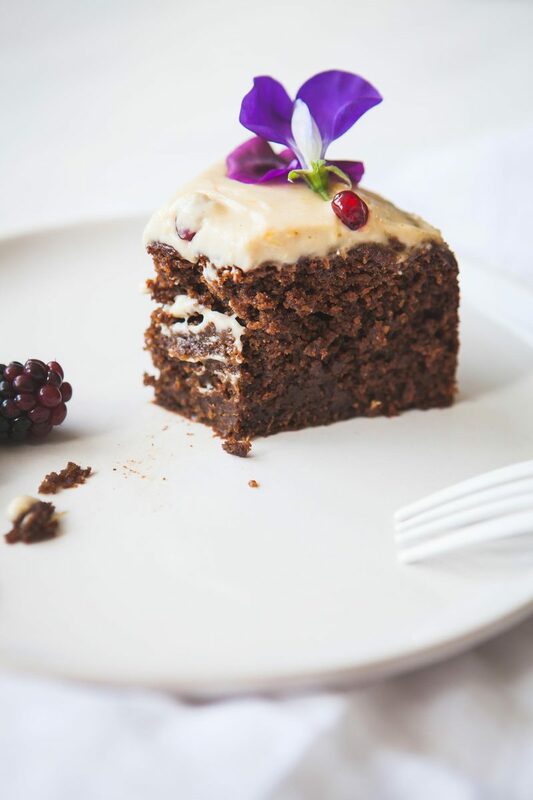 I know you will adore this cake – it’s absolutely heavenly – and festive of course. 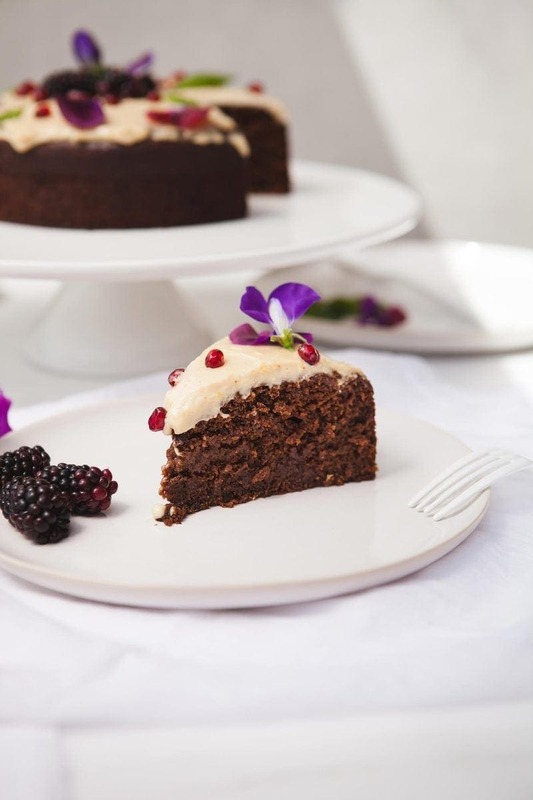 This healthy Vegan Ginger Cake is gluten free and filled with aromatic spices. Soft and moist, with a cashew lemon icing. Fills a 7½ inch cake tin. Pre-heat oven at 180˙C (360˙F) and lightly coat a 7½ inch spring-form cake tin with oil and a dusting of cacao powder. Blend the buckwheat flour, almond meal, baking powder, baking soda, salt and all spices in a food processor to combine. In a blender, whiz the psyllium husks with the coconut milk for 10 seconds, then pour into the food processor. Add the rest of the liquid ingredients (molasses, rice malt syrup, vanilla, coconut oil) and the drained and pitted dates. Blend till the mixture is a smooth batter. Pour contents into cake tin and bake (force fan) for 40 minutes. Remove from oven and let cool in the tin for 10 minutes, then take cake out and let cool completely on a wire rack. Drain the cashews and blend with the coconut oil, nut milk, vanilla, maple syrup, salt, lemon juice and lemon essential oil if using. Add the soy lecithin and blend once more – the mixture will thicken. Transfer icing to a bowl and fold through the lemon zest. Set in the freezer for an hour then spread liberally over cake just before serving. 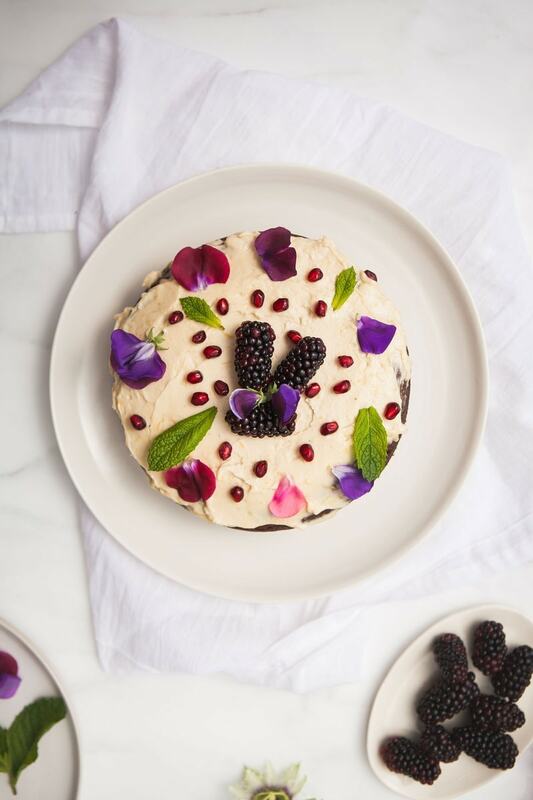 Decorate with fresh petals, mint, pomegranate, blackberries. You can keep left over icing in the fridge. Use fresh spices for the most flavoursome result. Ice the cake just before serving so it doesn't discolour. The essential oil I used in this recipe is doTERRA, because quite simply, they are the absolute best quality. If you’d like to get started with your own account, you can either book a complementary consult with me to learn more first, or join with doTERRA right away. Thanks for reading, see you again next week!